We are one of the famous manufacturers and traders of Water Park Play Equipment that is widely demanded for its appealing appearance and smooth finish. Manufactured in compliance with the predefined industry standards, the offered range is easy to install and requires minimal maintenance. Our customers can avail water park play equipment at budget friendly rates. 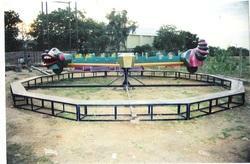 Looking for AMUSEMENT PARK RIDES ?